Haumea is one of the strangest known objects in the solar system. It is as big across as Pluto but shaped like a cigar or perhaps an American football. These two images show the two extremes of its appearance as it spins. The dwarf planets and other objects that litter the Kuiper belt in the far reaches of our solar system are a strange bunch, but astronomers have found what they think might be the weirdest one. Discovered on Dec. 28, 2004 (catalogued as 2003 EL61 and nicknamed "Santa" for a time), the minor planet now known as the dwarf planet Haumea, to honor its Hawaiian discovery, is as big across as Pluto and one-third of its mass, but shaped something "like a big squashed cigar," said one of the astronomers who studies the object, Mike Brown of Caltech. From its shape to its satellites, Haumea is a strange object, but one that could shed light on the history of collisions in the solar system, as well as the early environment of the Kuiper belt, which sits out beyond the orbit of Neptune. When astronomers first found this object, they noticed that it was getting brighter and fainter by about 25 percent every two hours. If it were round, that observation would likely mean the object rotates every two hours, an incredible rate that would rip it apart, Brown said. Astronomers determined that it was more likely that Haumea is elongated and rotating every four hours. "We see this thing tumbling end over end getting brighter and fainter," Brown said. Haumea is the fastest spinning object in the solar system. The object's odd shape is a direct result of the spin. "Because of this spin, it pulls itself outward" at the equator in a bulge, Brown explained. The Earth has a less pronounced version of this bulge for the same reason. The hyperactive spin of Haumea means that if you were standing on its surface, "your gravity would be very different," Brown said. Specifically, it would hold you down with much less of a grip than the Earth. "The faster it spins, the more it wants to fling you outward," Brown said. But Haumea's football shape and frantic spin aren't the only weird things about it. It also has an unusual satellite. Several Kuiper belt objects are known to each have a satellite orbiting them, thought in many cases to be a smaller body captured by the bigger object's gravity. But it was apparent that Haumea's satellite, Hi'iaka didn't fit that mold. "It's way too small to be one of these captured objects," Brown said. It was also made of water ice. It turned out that Hi'iaka did fit the situation of a body hitting Haumea and scattering ice debris throughout the area. Haumea is big enough that it differentiated, like the Earth, so that its heaviest components settled to the core and the lightest, specifically ice, stayed at the surface. So when it collided, the pieces that were spewed out were mostly pure ice, the thinking goes. Subsequent observations of Hi'iaka determined its orbit and turned up another surprise: a second satellite, Namaka. No other Kuiper belt object is known to possess more than one satellite. Namaka is another product of the collision that shattered Haumea, likely sometime during the early history of the solar system, which formed 4.5 billion years ago. The suspected collision tells astronomers something about the early Kuiper belt. Haumea is a fairly big object and was likely hit by something similarly hefty. But "pretty big objects are pretty rare," Brown said, so either this was a chance strike, or there were more large objects in the early Kuiper belt object than there are at present. Brown says astronomers have no idea what might have happened to those objects -- whether they might have broken up in collisions or disappeared in some other scenario. Hi'iaka and Namaka aren't the only products of the collision; smaller shards also flew off the dwarf planet, settling into similar orbits around the Kuiper belt. "They go from the size of 100 miles across for the biggest one to ice balls," Brown said. The setup makes Haumea's name a perfect fit: Haumea was the Hawaiian goddess of childbirth, and the mother of many other Hawaiian deities (including Hi'iaka and Namaka), who were all born as chunks taken from her. Brown and his colleagues have found 10 of the biggest chunks from Haumea scattered around the Kuiper belt (and are naming them after more of Haumea's children). Others are sure to turn up, and likely have already been found, but no one knew what they actually were. "We have to realize that things that we already know in the Kuiper belt are shards," Brown said. Finding these bits of debris from Haumea's collision is a rare opportunity. "You can't do that anywhere else in the solar system," Brown said. Studying the shards and their distribution will not only shed light on the collision that broke up Haumea, but could help scientists better understand other such collisions, such as the one that created the moon from the infant Earth, for which the evidence is long gone. In those situations, "the shards all go away, Brown said, which makes Haumea "our best chance" to understand these other collisions. These "big cubes of ice," as Brown describes them, also dispelled one notion about the nature of the Kuiper belt. Astronomers had thought that dust in the region would coat any objects and obscure their true surface. But "these things look like beautiful ice cubes," Brown said. This finding means that when the surfaces of other Kuiper belt objects are observed, astronomers can better assume they are looking at the object's actual surface, not dust. Asked if there were any ideas as to why the dust wasn't coating the ice shards, Brown replied, "No. None. Zero." Despite the recent insights, much remains a mystery about Haumea. Its exact shape, for one thing, is not precisely known. Its internal structure isn't well known either. Astronomers know it has a rocky core, but whether there is a heavier iron core within that is uncertain. The timing of eclipses with Haumea's satellites could help determine this because an iron core would cause certain changes in the timing of those eclipses do its heavier pull. Brown and his colleagues plan to observe these eclipses with ground-based telescopes over the next few years. 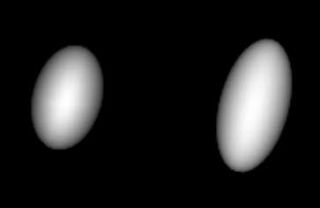 Observing Haumea's satellites will also help astronomers better constrain the object's mass. One particularly exciting observation will be made with the renewed Hubble Space Telescope in a few weeks. Hubble will watch an occultation of Haumea's two satellite, an event that occurs only twice every 300 years. The timing of the passage of one of the satellites in front of the other is only known to within about five hours. With Hubble's precise observation, that timing can be narrowed down to within a matter of seconds. The observation will tell astronomers more precisely where the satellites are in orbit around Haumea, Brown explained. Observations such as these just can't be done with the other Kuiper belt objects -- Haumea is a special case. "Haumea is the only one out there that we can do this with," Brown said.